Yachts taking part in the Clipper Round the World Yacht Race have set sail from the Humber. Thousands of people gathered to watch the 10 yachts begin their 35,000-mile (56,000 km) voyage across the world's major oceans. 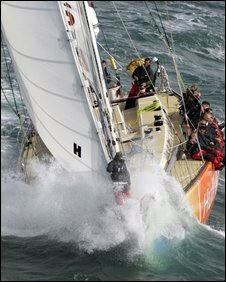 The race was created by Sir Robin Knox-Johnston after he completed the first solo non-stop circumnavigation of the globe 40 years ago. The yachts are due to finish in Hull in July 2010. They are crewed by non-professional sailors led by a professional skipper. The non-professional crews make the race unique in world yacht racing. Alan Moss, one of the competitors, said he was hoping to use his experience as an air traffic controller on board one of the yachts. He said: "Hopefully being calm during problems and in times of stress, that should help. "On the boat as the bowman I will be running the foredeck of the boat, which is actually sort of the meaty end of the boat - at the front end where it gets dunked in the water - we get cold and wet at 3am." Sir Robin said: "The highest thing you can do in mountaineering is climb Mount Everest. I was looking for the equivalent in sailing and I thought well it's the circumnavigation. "And there must be hundreds, thousands, of people out there who would love to complete a circumnavigation, have a boat and haven't got confidence, or don't have the money to buy a boat."